The Carre cut is in the shape of a square, and is intended to provide a solution to the eternal quest to use the maximum amount of the rough diamond and minimize the amount of waste during cutting. Diamonds chosen to be cut into the Carre cut are those rough diamonds that have the perfect shape – a crystal with a pyramid shape whose sides and facets are all equal in size. The Carre cut is based on cutting straight facets shaped like steps, as opposed to polishing triangular shapes, which are used for polishing Round, Marquise, Pear, Heart, and other diamonds. In some ways, this results in less sparkle and less light refracted back, but it allows for the preservation of the original shape of the diamond and a more optimal use of the rough stone. Carre cut diamonds use between 61% and 65% of the original diamond (by comparison, round diamonds use between 47% and 51% and marquise diamonds use between 30% and 35%). Despite this, the absence of triangular cut facets like in round diamonds prevents some of the small faults from being hidden, though these are not felt in round diamonds because of their light sparkle and the bright colors. In Carre cut polished diamonds, almost all faults stand out and are perceived. Therefore, only rough diamonds of very high quality and clarity are suitable for Carre cuts. When planning the princess cut, its designers attempted to surmount this problem. 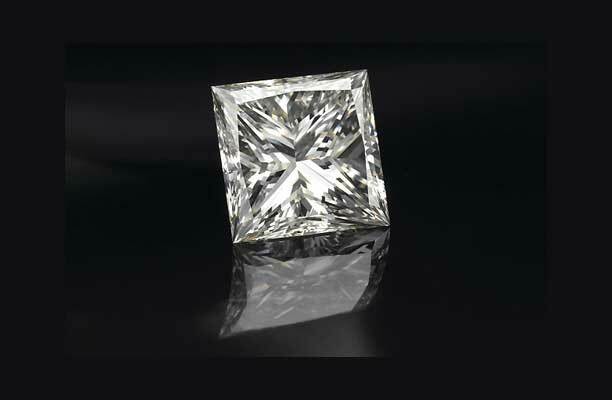 That cut combines the optimization of the square diamond crystal and the step-cuts with the cutting of triangular facets as in the round cuts, in order to increase the fire and hide the minor faults. The Carre cut offer many possibilities for jewelry design and bracelets, and therefore many know how to utilize it.